Travis Raymond '06 was pre-med and a biology major in his junior year at St. Scholastica when a friend looked him in the eyes, and everything changed. "We had just learned in class that when your pupils dilate at different sizes, it's a warning sign for some serious medical issues," said Raymond. "My friend said, 'Travis, you need to get this checked out right now!' I did, and it turned out I had a cancerous brain tumor." Before he knew it, he was whisked off to emergency surgery, followed by intensive radiation treatments, and had to miss the remainder of his junior year. Fortunately, the surgery and treatments were successful and Raymond returned for his senior year. His eyesight, however, was forever impaired, ending his dream of becoming a doctor. Many people would see this as a devastating blow, but for Raymond, it was just another turn in the road. "It seems like with everything in my life, I aim to do one thing and then end up doing something totally different," he said. "I've learned you just don't know where life will take you. It's OK, though. I just embrace it." An unexpected path brought Raymond to St. Scholastica. "I had my heart set on a different college, but my family kept pressuring me to check out St. Scholastica. It wasn't until the day after my high school graduation that I decided to come. St. Scholastica gave me such a great financial aid package, I couldn't turn it down. It was a very late decision, but it turned out to be the right one." Raymond says he was a shy, self-proclaimed "nerdy" kid in high school who wasn't involved in many activities, but all that changed the moment he stepped foot on campus. "I heard the president of Student Senate give a speech at Convocation my freshman year and right then, I set a goal to give that speech myself someday," said Raymond. And, he did. Raymond became the president of Student Senate and got involved in many extracurricular activities. "St. Scholastica drew me in and opened me up to things I'd never experienced before." Raymond graduated with a bachelor's degree in biology and a minor in American Indian studies. With his goal of becoming a doctor derailed, he wasn't sure how he would use his degree. For some years, he worked in insurance and retail, but felt his true calling was in healthcare. When he and his spouse decided to move to Florida, he once again found where he was meant to be. Raymond says his degree in biology, grounded in the liberal arts, gave him a well-rounded education that landed him at Tampa General Hospital as a liver transplant assistant — a position he says is much more than just a job. "I work with post-transplant patients, about 900 at any given time," said Raymond. "I'm kind of like an office-based nurse. I handle everything from post-surgery care and education, to managing prescriptions, to scheduling annual appointments, and getting patients cleared to do whatever they want to do in life after their transplant." Raymond says the position is a, "rewarding, heartfelt job," one that allows him to make a difference for people. 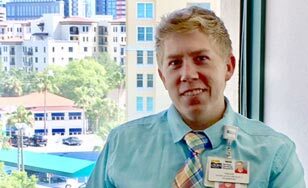 It's easy to see he is touching many lives, as he was recently nominated to receive the 2017 Tampa General Hospital Transplant Assistant of the Year award. "Many people who have liver transplants have been very hard on themselves," said Raymond. "It's so amazing to see the positive changes they make in their lives after getting a transplant. They are so appreciative of what I do to help them." Raymond says everything in his life prepared him for this role, including the unexpected turns that led him to St. Scholastica and even his bout with cancer. "I would tell students considering St. Scholastica or a degree in biology to follow their heart and do what makes them happy. You won't always know where life will lead you, but just keep your options open and the rest will happen." For more information about St. Scholastica’s biology program, check out our website or come for a visit. Students learn in newly-remodeled biology labs and an anatomy lab with human donor bodies, one of few in the nation for undergraduate students.